I read a lot. I mean A LOT. I may review one or two books a week, but I read a bunch more than that. The bulk of what I read is catalogued over at my book blog. Anyway, Rob did a “ten books that have stayed with you” thing over on Facebook, and since I’m tired and crabby and really wanna finish decorating my tree, I’m going to participate. Again, these are in the order they occur to me. And I’m posting them without comment. Some are good literature, some are media tie-ins. All had something in them that has stuck in my brain. It should be noted that these are not a TOP ten, or BEST ten, they’re just ten books that I go back to from time to time. Honorable mentions go to Harriet the Spy, by Louise Fitzhugh, From the Mixed-Up Files of Mrs. Basil E. Frankweiler, by E.L. Konigsburg, and anything Keith R. A. DeCandido has ever written, especially his stuff within the Star Trek universe, but his original work as well, because he’s just so damned readable, and because he always has these details that seem insignificant until you realize that they make his characters sing. Seriously, go read Dragon Precinct (and its sequels) because they’re just AWESOME. So, why is this called “Bathtub Reading”? Because my measure of how much I adore a book is how long I’m willing to stay in the bath with it. Really good, gripping, compelling writing leaves me cold and pruney. Books that are just okay don’t cause me to linger that long. 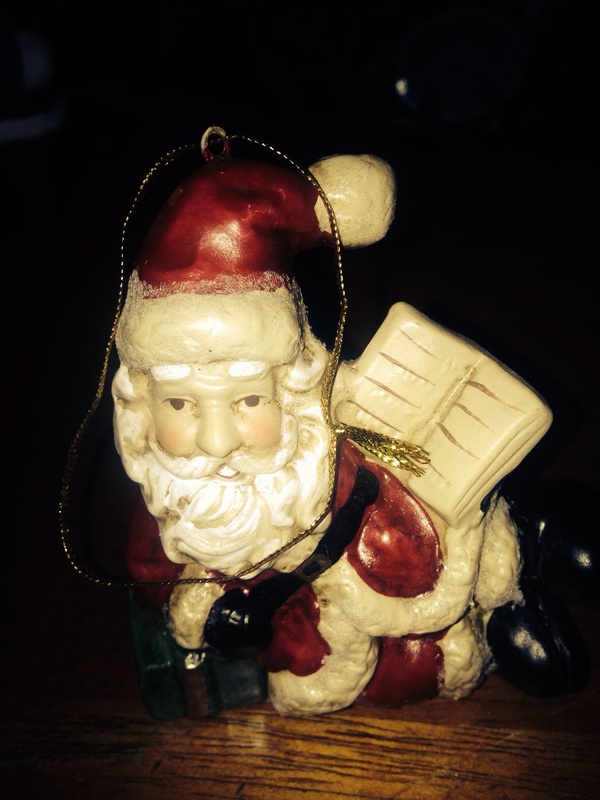 Today’s Santa: A Santa ornament with a book (perhaps the book of Naughty and Nice Names?) seemed an obvious choice for this post. He’s very heavy. Ceramic. Hand painted. Bathtub Reading by Melissa Bartell is licensed under a Creative Commons Attribution-NonCommercial-NoDerivatives 4.0 International License. Makes me want to grab a book and head for the tub. Susan recently posted..And Along Came Julie!